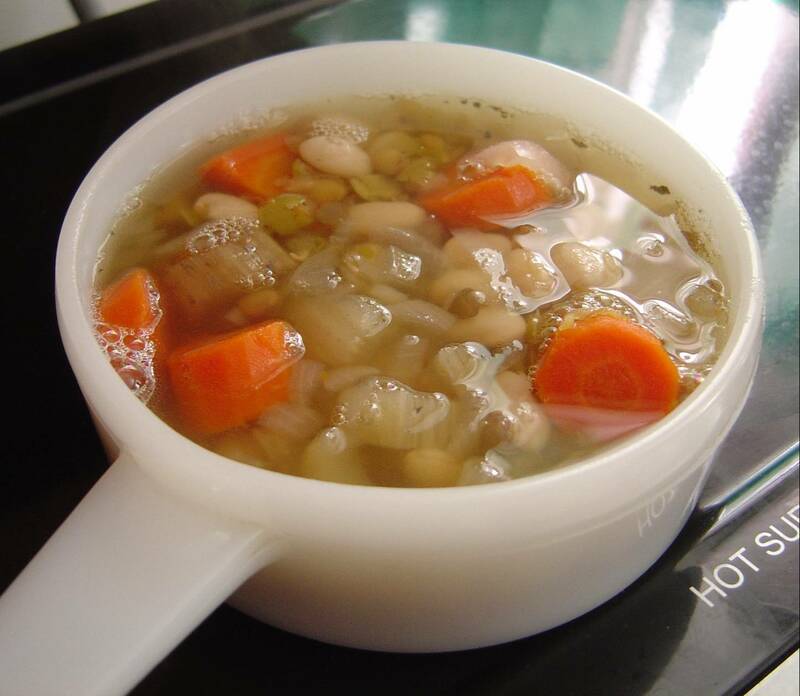 My Favorite Ham-Bean Soup is a great option to get more mileage from ham. Easter is usually the best time to get ham on sale. If you want to save money, you can do what I do. Either buy an extra ham if you’re having lots of company to feed or get a ham sliced into one-inch thick slices to make soup and then casseroles. The butcher can even slice part of a whole ham into one-inch slices and leave half for your holiday dinner. Whatever way you decide, you will love how easy it is to pull a slice of ham out of your freezer when the urge for soup or just a slice of ham as the entree for dinner calls to you. My Favorite Ham-Bean Soup recipe is a light meal in itself with enough vegetables, a few varieties of beans, ham, and noodles or rice depending on your mood. When my soup is finished cooking, I like to remove all fat and cut the ham into pieces for another meal. This way is how I can get double duty out of the ham. I can flavor my soup while feeding my family another meal out of it through anything from casseroles to ham-stuffed crepes. However, I never eat homemade soup on the first day I make it. I always put it in the refrigerator so that the grease hardens and can be scrapped off the next day. After all, why waste calories eating artery-clogging grease when you can save those calories on things that taste good? Surprisingly though, ham soup cooked this way doesn’t seem to have all that much fat to skim off compared to chicken or beef soup, which attracts it like a magnet. If you have cabbage on hand, you can clean and chop some up for my favorite ham-bean soup. The more cabbage you add, the sweeter your soup will become. Try putting about one-fourth of a medium size cabbage in your soup for a nice change. Brown your chopped onions and garlic in the olive oil until golden brown. Set aside from the heat to stir in the flour to coat. Return to the heat and add the rest of the ingredients with the water. Cook until the beans are soft. Add some cooked noodles, rice, or even dumplings for a change. The ham can be used for another meal. If you like, you can take it apart and throw the pieces back in your soup. However, I always make another dinner like pot pies, crepes, or another casserole. Oh my goodness, I never thought of adding cabbage. We love cabbage. I'm trying this recipe. Thanks !